When you love vintage, in particular vintage fashion, you have two main options to work with. You can search for authentic vintage clothing or you can score yourself some reproductions pieces. For vintage most people thrift, hit yard sales, flea markets, and scour online sites like Etsy/Ebay. For reproduction most people shop via Pinup Girl Clothing, Freddies of Pinewood, Miss L Fire, Lindy Bop, and Bernie Dexter just to name a few. Lately finding vintage seems to get more rare and difficult occurance. Most shops sell dresses only in a sizes x-small and small. Good on those who are but most women aren't. What is a girl to do who is having troubles finding the vintage she loves? Well, many go the route of reproduction. But then what happens when a girl cannot afford the $150 dollar reproduction dresses and $200 dollar reproduction jeans? How about meshing your vintage stash with modern pieces or better still, your vintage pieces with modern dresses (just for example) that have a vintage flare. So technicially the dress wouldn't be vintage and it wouldn't be reproduction but it would have a tinge of vintage to it. Then you can add your authentic vintage accessories to your outfit along with a great hair style to boot. Your end result will be a fantastically vintagey look all your own! 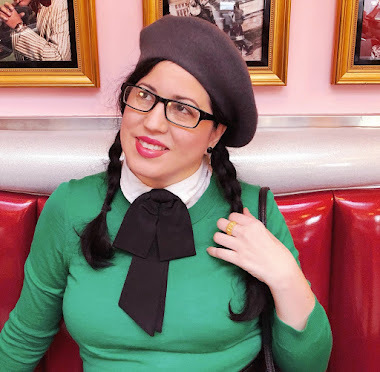 My cotton dress is from eShakti and my cropped cardigan is from Modcloth. 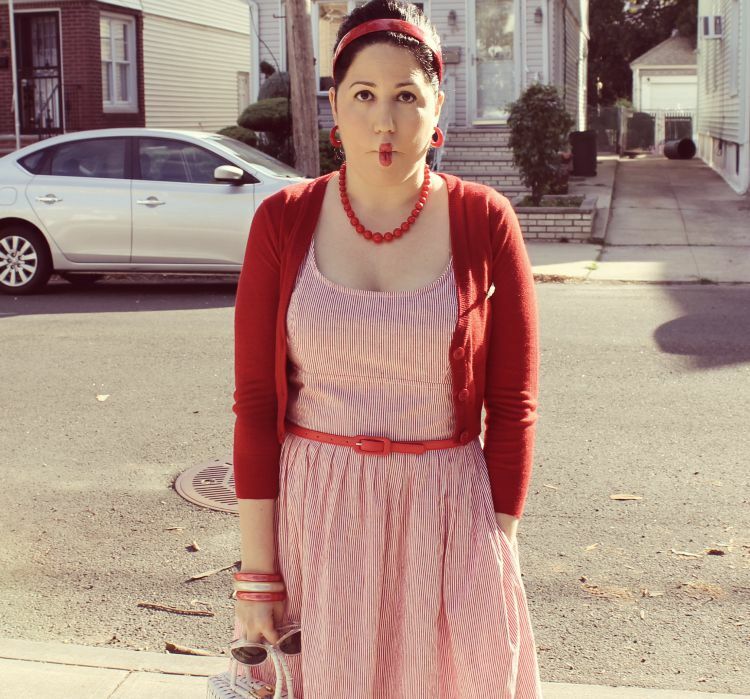 All of the accessories I paired my outfit with are vintage minus my sunglasses, headband, and belt. I really think both accessories and hair/makeup can easily turn a modern outfit into one that resinates a vintage style. Adding a little vintage really does go a long way. Have you experimented with different ways of expressing your vintage style? What do you think of simply adding a little vintage to your look compared to attempting to create a look that is entirely authentically vintage? This is exactly what I do, the majority of my wardrobe is high street but with vintage accessories it gives a vintage twist and my own style! Your outfit is adorable! 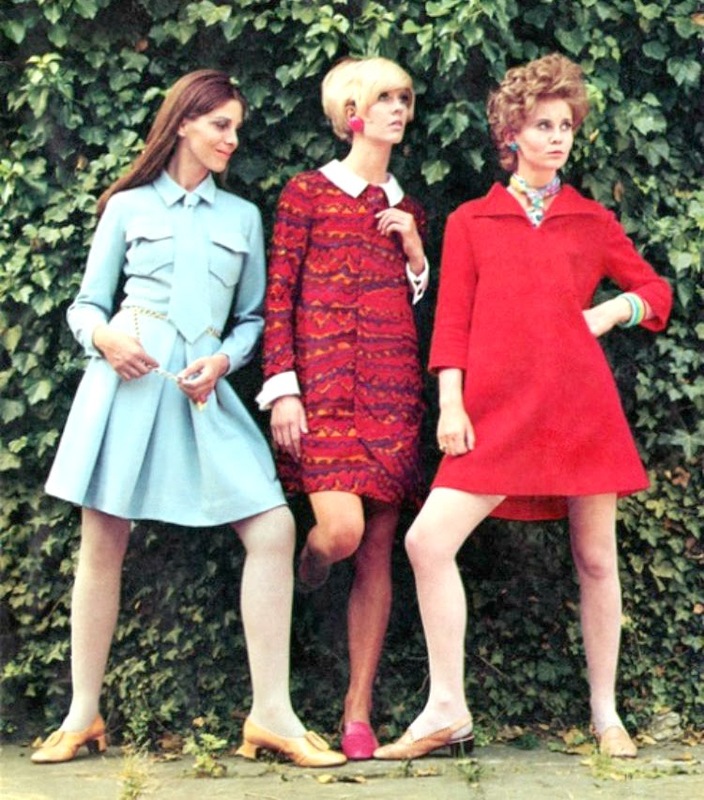 My favorite option is a third one...sew your own clothes from vintage patterns! For myself, I like a mix of vintage and not, just to keep in my comfort zone! Terrific post! Two thimbs up. b) on the market (solely because of what you've noticed: they are too small for the "regular" folk to get into). I love your site. I'll definitely be back! Thanks for visiting Go Retro. Seriously lovely outfit! I am with you 110%! A huge component of my wardrobe is the section I call my vintage appropriate pieces. Items made in the last 20 years that look the old school part, but are thoroughly modern. My closet would shrink rapidly if those vanished and I hope that they never do, because they're very much the bread and butter of my daily looks.